Innovative design is a necessity in the modern laboratory. The explosive rate of technology growth provides the laboratory with a host of challenges. These include providing adaptable, environmentally stable space, and a number of power outlets with robust wiring to serve electronic equipment needs. The generic lab module is designed to respond to rapidly changing space needs. It has the flexibility to accommodate a variety of laboratory situations, from electronics labs to fume hood intensive chemistry labs. Today's laboratories will often include built-in or modular wood, metal, or plastic laminate cabinets known as casework as well as stainless steel sinks and minimal lab furniture. 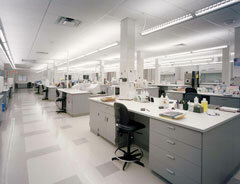 Laboratory casework includes base cabinets, wall cabinets, and storage and supply cabinets. Casework may be made of several different materials, the most common being wood, plastic laminate, and metal. The type of casework installed depends on the needs of the particular laboratory. Different settings which employ the use of laboratory casework include schools, hospitals, pharmaceutical and biotech companies. A traditional approach often used to outfit laboratories is installation of "made to order" furniture and cabinetry. It can be difficult to reuse and is most often scrapped when a space change to the laboratory setting is needed. The newest type of laboratory casework is fully modular, which allows it to be customized and rearranged to fit the growing needs of the laboratory. Wood casework is often made out of oak, birch, or a high-grade plywood. The cabinet doors come in a variety of designs. Plastic laminate casework is an economical alternative to wood and metal casework, and is often used in elementary, middle school, and high school science, art, or home economics labs. Metal casework can come in a variety of colors, and is usually painted with a chemically-resistant baked on epoxy powder coating. Steel casework has unique benefits, including a smooth and easily cleaned surface with the durability to stand up to strong chemicals and abrasion. Stainless steel casework is a particularly good choice for areas subject to high moisture and frequent cleaning as well as heavy abrasion and abuse. For high-moisture areas, a cheaper alternative to stainless steel casework is phenolic resin casework, which is corrosion and fire resistant. Quality casework built to last should feature a through-bolt construction technique, as opposed to flimsy dowels and glue. It should also have a chemically-resistant, easy to clean finish. 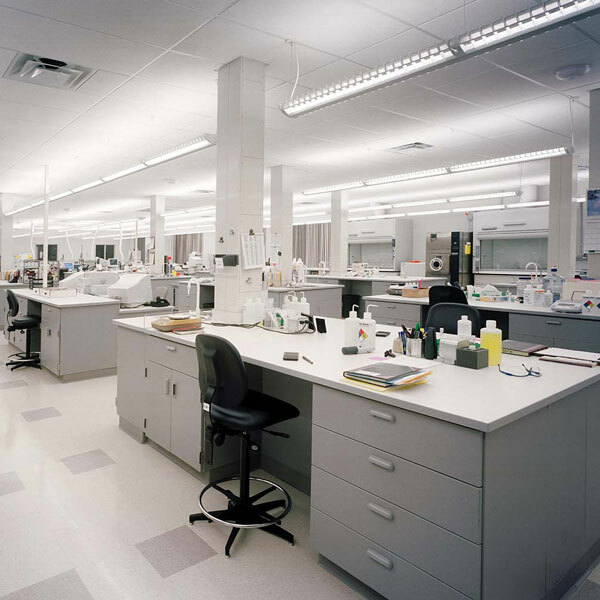 Other laboratory components which complement casework include fume hoods, countertops, sinks, and plumbing fixtures. Along with these products, casework is a necessity in any laboratory and provides a convenient means of storage and organization. Longo Labs is a New Jersey-based supplier and installer of laboratory casework products as well as fume hoods and accessories. ISEC is a Colorado-based specialty construction firm. Its laboratory division offers lab furniture and lab equipment subcontracting services. Hanson Lab is a California-based laboratory designer, builder, and installer. 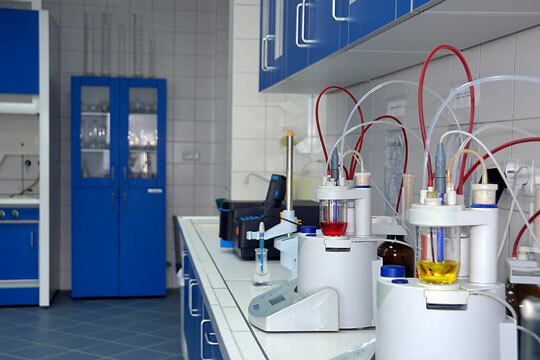 Sheldon Lab Systems offers laboratory furniture and equipment for the educational market. Kewaunee Scientific specializes in laboratory furniture and fume hoods for education, research, government, and health care applications. Leonard Peterson & Company is a well-known manufacturer of wood laboratory and technical furniture. Diversified Woodcrafts offers a full range of furniture for schools, research labs and industry. TMI Systems designs and builds laminate casework, architectural woodwork, and countertops. Case Systems is a manufacturer of plastic laminate furniture and casework for schools universities, libraries, hospitals, and laboratories. LSI Corp designs and produces laminate casework systems and related products. Stevens Industries is a full-line manufacturer of laminated panels, furniture, and cabinets. Kewaunee Scientific features steel laboratory furniture with smooth, easy-to-maintain surfaces and rugged, heavy gauge steel full-frame construction. BMC designs and manufactures a complete line of metal laboratory casework, fume hoods and accessories. Mott Manufacturing designs and manufactures a line of quality steel laboratory furniture. HEMCO Corporation offers laboratory planning solutions, casework, lab tops, and fume hoods. Multi-Lab by Keur manufactures steel laboratory furniture, fume hoods and accessories. Bedcolab features laboratory furniture systems and fume hoods for research, education, industrial, medical, clinical, diagnostic, and pharmaceutical labs. All rights reserved. RSS feed. About Us. LaboratoryCasework.org is a Chosen Sites™ reference source.